It seems there is a movement in Education surrounding Genius Hour. 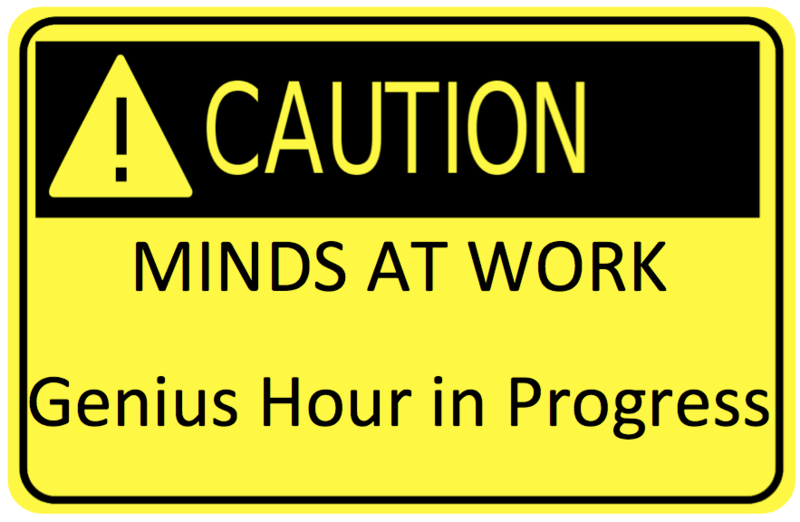 I have been researching what Genius Hour is. Check out the video below to get an idea of what it is. What I get from all the research is Genius Hour is basically letting the students choose something they are interested in and have them research and present their projects to the class. Then share those projects with the school community. The idea is by giving the students an outlet to focus on something they are really interested in and / or passionate about that they will be excited to come to school and their productivity will go up. I like that idea. It gives the students something to look forward to. After doing some research on the Genius Hour website and Genius Hour Wikipage I come to the conclusion that this is something that fits my program to a tee. I usually let my students choose a project they are in interested in to finish out the year. So I am planning on adding this concept to my gifted classes. http://geniushour.wikispaces.com/ This has some awesome resources on it. It contains documents, blog links, and student project ideas. http://www.geniushour.com/ This is Chris Kelser’s website. It is very informative. He has links to many topics dealing with Genius Hour. http://www.livebinders.com/play/play/829279 This is the Genius Hour Livebinder. This is full of awesome resources from several different people. https://theglobalgeniushourproject.wikispaces.com/ This is a wikipage where you can join in on the Global Genius Hour Project where you can add pages of what you students are doing. http://www.20timeineducation.com/ This is a website dedicated to helping teachers make Genius Hour happen in your classroom. I am hoping that I can place some videos or some pictures of projects my students do in the coming months.